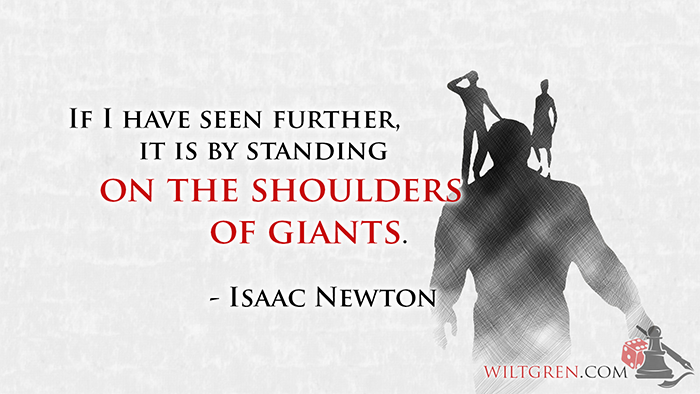 Have you ever stood on the shoulders of giants to see further? I do every chance I get, at least metaphorically. It’s one reason I’ve been so successful and productive. Why reinvent the wheel if you can have a chance to learn how the giants do it? My first task for any new project is to do my homework. I search out the experts in the field and try to understand how they solved the problem. I learn a lot in the process too! Depending on what I need to get out of it, I may either adopt the best practices approach I discover or I may take time to develop a way to improve on what the giants have done. Rarely does that require me to throw out their insights and start over. In fact, looking at what they’ve done often inspires me to come up with new approaches. 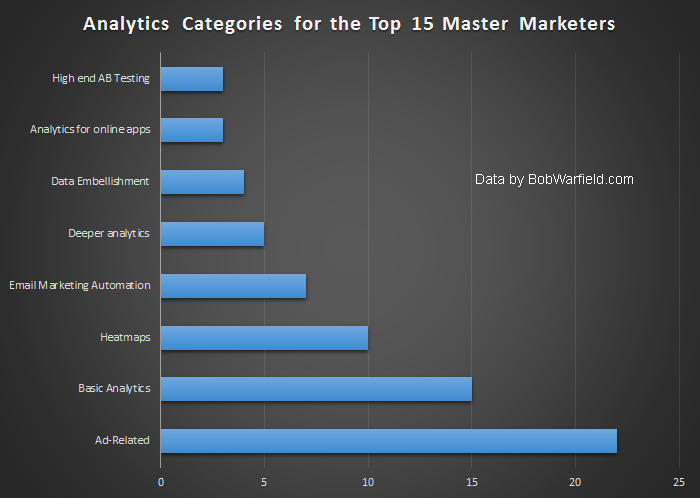 My series on the Top 15 Masters of the Digital Marketing World is all about that approach. 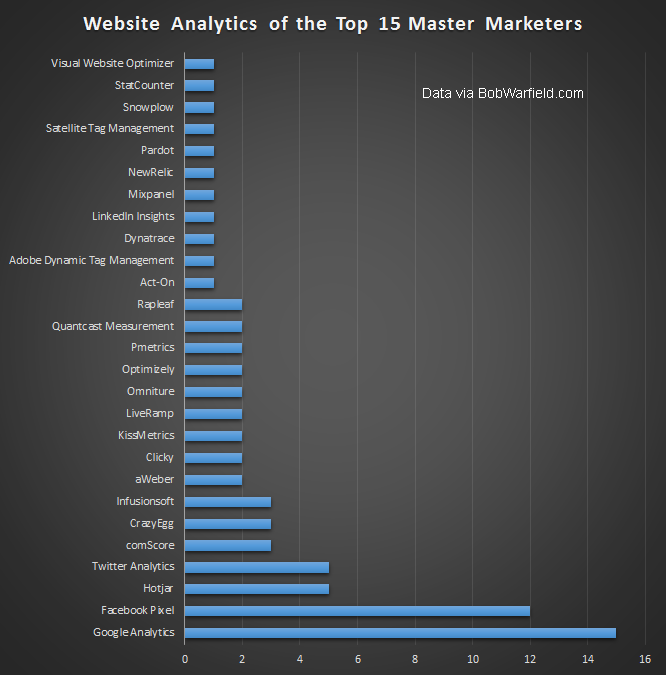 In this article, I want to talk about what tools the Top 15 are using for their website analytics. There’s some fascinating insights to be had, so follow along and we’ll see how they learn what their site visitors are up to. My first takeaway is you need to immediately install Google Analytics and the Facebook Pixel if you haven’t already, LOL! But what are these other things? Ad-Related: These analytics help marketers to target ads more effectively. For example, with the Facebook Pixel, you can create remarketing ads for folks that visited your product pages. They’ll be reminded of the product by an ad on Facebook, but only if they actually visited your page in the past. This bar is large because it takes multiple solutions to cover the whole problem. Basic Analytics: This is Google Analytics, pure and simple. Heatmaps: Wouldn’t it be awesome to see exactly which parts of any page your visitors viewed or clicked on? You’d learn a lot, which is why Heatmaps are so popular. In fact, they may even be more popular than what’s shown. The reason is that I didn’t include SumoMe users, which is how I get my heatmaps. There’s no way to tell whether they’re using SumoMe for heatmaps or just for popups. Email Marketing Automation: The ability to know which webpages your email reader has visited allows for awesome personalization. It helps you get the right information to your email readers which is in everyone’s best interest. I use this extensively and have talked more about it in my article on upgrading beyond Mailchimp. Deeper Analytics: These packages, like Kissmetrics, are for when you need the next step beyond Google Analytics. Typically, they help you understand better what inviduals are doing. Google Analytics is primarily about what overall groups are doing. Data Embellishment: What if you could tell which companies were interested in your website based on which IP address visitors came from or perhaps their email addresses? Or what if you wanted to understand the detailed demographics of your visitors? This is useful for many businesses, and it’s what I call Data Embellishment. Analytics for Online Apps: If you have an app on your website, a whole new world of Analytics is important to you. High End A/B Testing: Google Analytics makes a certain amount of AB Testing available for free, but there are more sophisticated options available that can make it easier for non-technical types or just plain more powerful. Maybe Google Analytics is all you need. Or, maybe you want more. I haven’t really felt a need to spend money on the other functions yet. 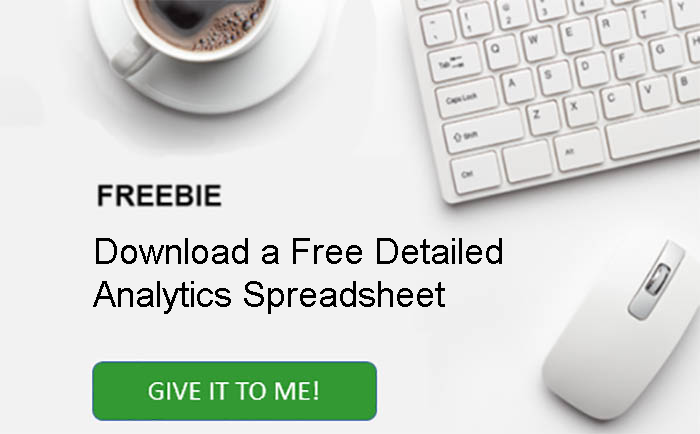 Would you like a spreadsheet with all of this information plus a more detailed breakdown of what every package does and a link to where you can get the different analytics packages?